I am delighted to be working with Yoga Journal to bring you a brand new online course that gives you an in-depth exploration of the theory and practice of Yin Yoga. 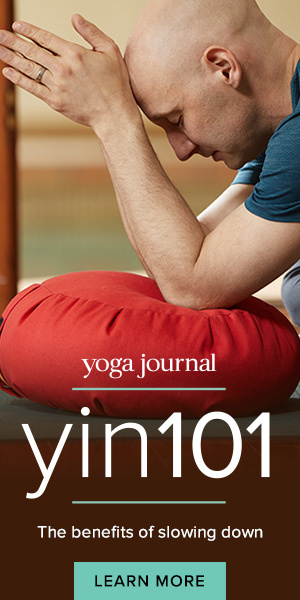 This 6-week course delves into the physical, energetic, and meditative aspects of Yin Yoga. Here’s a preview of the course. You can purchase the course today using discount code JSUMMERS for $75 off the price of the course (that’s only $225). This course qualifies for 20 “non-contact” continuing education hours with Yoga Alliance. There’s a yin side to your body, a yin side to your energy, and a yin side to your mind. And if you’re not taking care of your yin side, you feel imbalanced: Stressed, edgy, and agitated from too much yang. This 6-week journey begins with the body, revealing and releasing deep layers of tension held within your fascia. You’ll learn the science and experience of why your fascia loves Yin Yoga. Then I will lead you through the energetic channels that balance your yin and yang sides, creating a balanced space to end your journey in a meditative state – one that turns “standard” meditation rules on their head. Yin Yoga weaves all three layers of your being – body, energy, and mind – into a seamless whole, promising a sublime experience of stillness and peace. All bodies, and all minds, are welcome as we embrace the “other half” of practice together in this course. The course also includes two Facebook Live sessions with Josh, in which you can ask questions related to coursework.